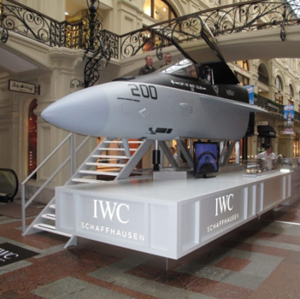 The legendary watchmaker IWC Schaffhausen, known worldwide for its exclusive models, has announced exhibition to be held in August-September in Moscow’s GUM. During the exhibition, the company will present its new collection of pilot’s models – IWC Pilot’s Watches. Note that Russia is the first country hosting the exhibition, since the fighter on the Watch Salon in Geneva. The main element of this exhibition will be a real model of a jet fighter with integrated simulator flights. Those who appreciate the IWC watch factory, and is a fan, can not only appreciate original new products, evaluate them, and try your hand at flying and managing fighter.